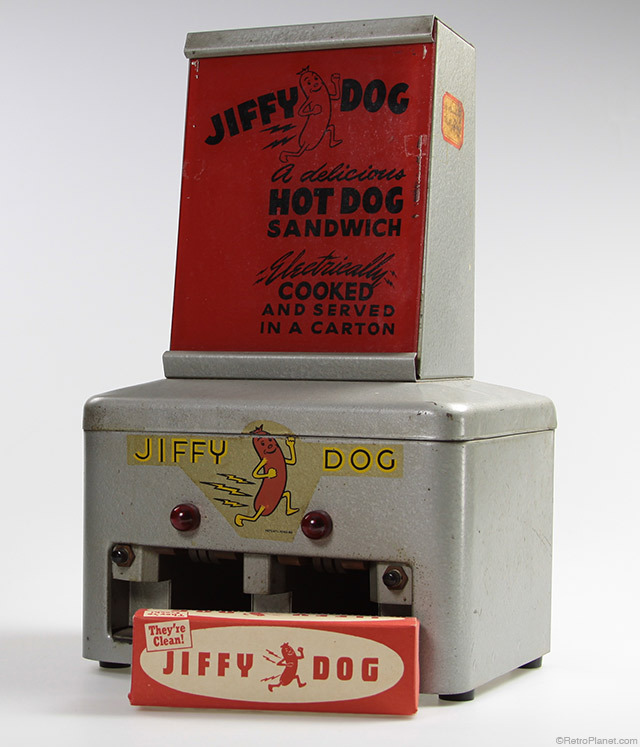 One of the cool inventions made for vending a steaming hot dog, was the Jiffy Dog electric restaurant food service machine. The machine pictured here was made in the 1940s and was found at the West Palm Beach Antiques Festival. 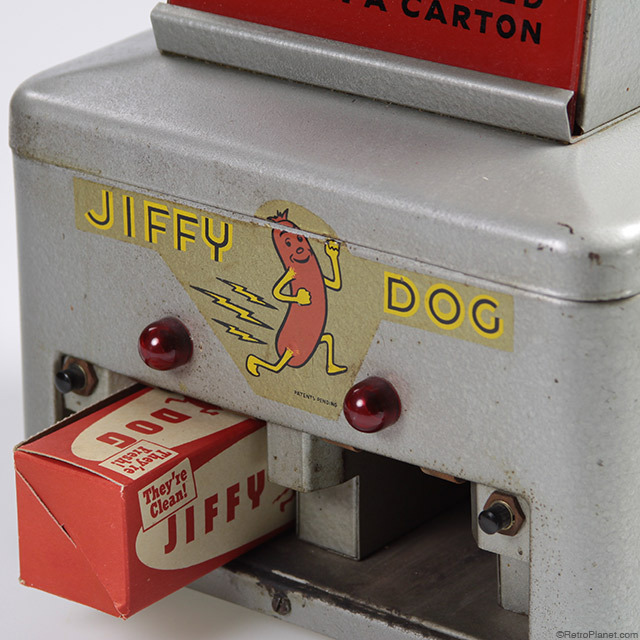 Manufactured in the 1940s, the Jiffy Dog Hot Dog Machine was a clever invention for heating prepackaged hot dogs at all kinds of venues. These were used in places like restaurants, bars and bowling alleys. The vendors were supplied with prepackaged hot dogs that had been packaged and sealed in a waxed paper carton at the meat packing plant. This prevented the handling of the hot dogs while they were being heated and served. This clever method was promoted as producing a fresh, clean hot dog. We have a box that actually survived all these years, and it’s boldly printed with, “They’re Fresh! They’re Clean!”. Hot dogs were packed in cartons at the meat processing plants so they were kept clean and fresh. They simply needed to be heated with the electric Jiffy Dog machine, and they were ready to serve! To heat the hot dog in the carton, stainless steel electrode tabs came with each machine. These were inserted into the edge of the box to where they came into contact with the hot dog. The machine electrically heated up the electrode, which then heated the hot dog. Each tab was used once and then it was thrown away. In 95 seconds the hot dog was heated to 200°F. And the machine could cook up to two hot dogs at a time. The Jiffy Dog Company slogan was “It’s Cooked in the Carton”. The machines were used at all kinds of locations; restaurants, sporting events, bars and bowling alleys. Manufactured by Jiffy Dog Company, Inc.